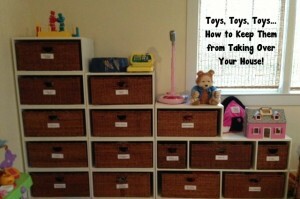 Toys, Toys, Toys… How To Keep Them From Taking Over Your House! As a Professional Organizer, I meet a good number of people frustrated with clutter. Many of them are busy Moms inundated with kids’ toys on every counter, table, tucked into corners and left just about everywhere else. So, how can a P.O. help? Good Professional Organizers have a stockpile of tips for combating clutter and creating order. The more we can share with you and you implement, the more likely the changes we make will last so you won’t have a mess start again as soon as we leave. We listen to your underlying issues, and keep them in mind at all times while aspiring to help you meet, and maintain, your goals. I’ll use my house as an example on how I recommend handling toys. Since I consistently follow the guidelines I’ve set for my home, it stays organized. I don’t have to ‘get organized’ only to have everything gradually start to fall apart again. Consistently following guidelines you set for yourself means you will be able to maintain order for the long haul with minimum effort. I use a lot of white Sterilite stacking drawers and they each contain separate items like American Girl Doll Stuff, Baby Doll Stuff, Girlie Legos and Food Stuff, just as a few examples. I have one for “More than One Piece” to hold a variety of small collections that don’t fall into another category. I have another one for “One Piece” for small one piece toys that don’t fall into another category or belong to a collection. I do this so I have the best chance of knowing where an item is when my kids inevitably asks where something is. Each drawer gets labeled by my label maker. Because they are stackable, I can set up any number of them in one of the designated toy areas of my house (the playroom, one of my children’s rooms, or the basement), already sorted and organized, depending on where my kids want to play with them. Different companies make the stacking drawers just a little different from each other, so it would be best to buy a whole bunch at once from the same company that can work with each other. The “Limiting Container” concept works twice here. The drawers themselves act as limiting containers, and so do the number of drawers that you own. Once they are all full, you have to eliminate a type of outgrown item that is in one if you need a new one. Buy a generous amount of drawers the first time and you will easily be able to make that number of drawers your limit. On the main floor of my house there is a designated playroom. My kids are a bit older now (my youngest is 10) but I remember the days of toys being played with all over the main level of the house. When they are younger they want to be near you. That’s the way it is and it’s a wonderful thing! So by playroom, in my case it really means a room to store toys at the end of the day. The toys were/are sorted like with like and kept in appropriate, No fuss containers. The most used type of toy might have two containers, one upstairs in their room and one downstairs in the playroom. If they are looking for that type of toy it would then be in one of two places. If you don’t have a playroom on the main floor of a multi level house, there are systems that can match your décor so you can have a designated, reasonable toy zone but still have it look nice and blend in with the rest of the grown up space. I have used the Abbeville System by Ballard Designs in traditional homes (See picture.) It offers great storage, is versatile, kid friendly, No Fuss but still looks dressed up. Contemporary homes can use a number of systems from the oh-so-lovely Ikea. Now that my kids are older, I can drop some of the ‘No Fuss’ philosophy. The games are behind doors in 2 nice cabinets. The benefit of allowing a reasonable amount of toys on the main level of your house is that it makes cleaning up so much easier. Hauling a bunch of things upstairs or downstairs daily is not efficient or fun for anyone! In my experience, asking young children if they want to keep or throw away a never-ending stream of items will overwhelm them and make them resistant. They will become suspicious of your purging efforts and want to keep everything. Your efforts will stall. Allow them a reasonable number of decisions, adhere to their choices, and make the other ones yourself when they are not around. You will be doing them a favor this way. Sort like with like for the items that will stay, and name homes to create boundaries. Their things will now be easy for them, and you, to put away. For older kids, their rooms should be respected as much as possible. At a certain point they should have (almost) full say in what stays or goes, as long as they are respecting the home and keeping all their stuff within the confines of their room. My 10 year old daughter has grown up with me being a Professional Organizer since she was 6. Up until she was 9, I decluttered her room about twice a year while she was at school. Usable items she was too old for went into the temporary holding place that is my Donation Station. One day, about a year ago, she told me she didn’t want me to do that anymore. It wasn’t in a combative, resistant way; it was in a tone that I knew she was ready to handle these decisions on her own in a mature enough fashion. Now, she cleans her room once a week, puts like with like so everything is easy to find again, and is willing to part with unwanteds. It’s a beautiful thing, really! What I do works for me. It may be helpful to others but they probably should tweak it to something best suited for them. Make concrete rules, ones that don’t allow for excuse making. Try not to cut corners, and to not over-accumulate. Happy Organizing! If you would like to receive other posts from this blog series (past and future), please visit www.jeanlinderorganizing.com/contact-us/ and send me a note! Jean Linder is a Professional Organizer working in homes and offices throughout Suffolk County Long Island. Well already everyone be aware of that http://genericcialis-online.biz found with ease in the Internet. In exclusive on our website it is full of it. But you forget and constantly you ask. Click to instantly receive tips on transforming a chaotic space and maintaining order.